I neither endorse nor condemn this product. The information as published here is a matter of public record. The information is placed here for the education of those that wish to read it. Most of the information presented here is from a Bayer leaflet. Further information is available from Bayer on request. BEFORE you obtain or use the material concerned please ascertain the legality of doing so in your location as the product may or may not be approved in your geographic State or Country. The Varroa mite presents a serious problem to both amateur and professional beekeepers. Left unchecked, it can seriously damage and ultimately destroy entire colonies. This can be disastrous, not just for beekeepers, but also for arable farmers and horticulturists, particularly top-fruit growers, who depend largely on bees for pollination of their crops. And it is bad news for the environment, since bees have an important part to play in maintaining the balance of nature. Varroasis is a serious problem which demands a professional solution. And Bayer research and development has provided it. 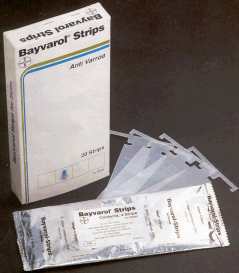 A solution which offers effective control with simplicity of use: new Bayvarol Strips. For large colonies occupying several brood chambers, two strips can be joined together end to end, making possible their insertion and removal without separating the chambers. (See Fig. 2)In normally developed colonies, four strips should be used, while nuclei and young colonies should receive half that dose. Large colonies should be treated with four strips per brood-chamber, distributed over the central bee spaces. When to use... Best efficacy is to be expected when Bayvarol Strips are used in late summer, after the honey harvest. Ideally, they should not be used during peak honey flow periods. However, they can be used at any time of year for diagnosis, or for treatment of severe infestations where there is a threat to the survival of the colony. Diagnosis... Before inserting the strips, the floor tray should be covered with a clean sheet of paper. This is then checked for the presence of dead Varroa mites 24 hours later. Treatment... The strips should be left in the colonies for a maximum of 6 weeks. For the diagnosis and therapy of Varroasis on bees only. Avoid the strips coming into contact with honey to be harvested for human consumption. When using, do not eat, drink or smoke. Wash hands before meals and after work. No withdrawal period for honey is required, regardless of the time of year when Bayvarol is used. Other bee produce should not be taken for human consumption until the spring following the treatment. Do not open the foil bags until immediately prior to use. Do not use after expiry date. Dispose of used strips safely by wrapping in paper and placing them in domestic refuse. Dangerous to fish. Do not contaminate ponds, waterways or ditches with used strips or packaging. Package quantities... Each pack contains 20 strips. Bayvarol Strips rely on a novel method of delivery to provide diagnosis and control. Treatment is by means of plastic strips impregnated with an active ingredient which destroys the mites on contact. The strips are specially designed to be suspended in the spaces between the combs in the central brood-rearing area. Bees crawling over them distribute the active ingredient throughout the whole colony by physical contact, giving fast control of existing mites, and lasting control of those which hatch with the young bees from the sealed brood. Effective and fast... The knock-down effect of Bayvarol Strips is remarkable. 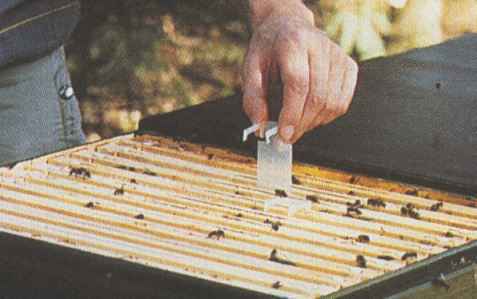 Within 24 hours, dead mites will drop from the bees, a speed of action which makes the strips particularly useful for diagnosis and confirmation of the infestation. During the following weeks, the strips continue to kill the mites present in the hive, on foraging bees, and on newly hatched bees. Safety first!... Flumethrin, the active ingredient in Bayvarol Strips, is highly selective against the Varroa mite, while not affecting the bee colony, thus giving an enormous margin of safety. Even with the most sophisticated current analytical techniques, no residues can be detected in the honey, and no withdrawal period is required. This also means that treatment can be carried out at any time, though the ideal time is in late summer, immediately after the honey season. Bayvarol is a veterinary medicine, and has therefore undergone the most rigorous independent testing for safety, quality and efficacy in order for a licence to be granted. As a licensed medicine, distribution is controlled, and it is available only from veterinary surgeons, registered animal health distributors, and some agricultural pharmacists.